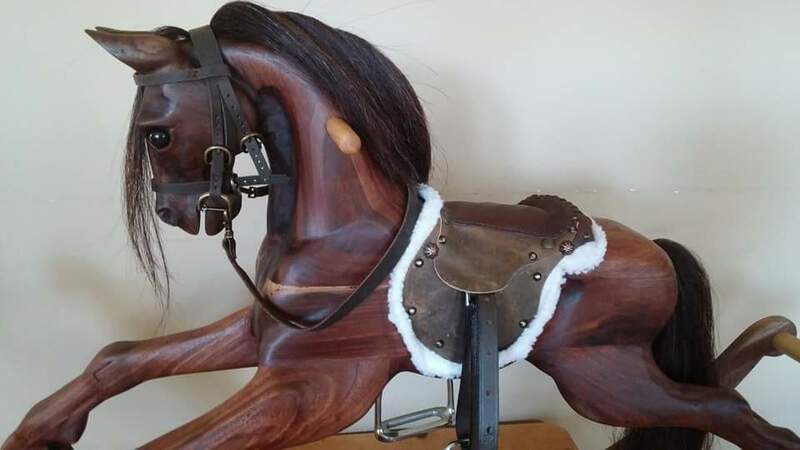 Heartwood Rocking Horses are designed with the child in mind. I don’t always use decorative leather tack or stirrups, because I see children struggle to use these items when riding the horse. I would rather the child have sturdy hand and foot holds and an immovable seat that they can climb on, and be able to explore using their balance and muscles to ride. The foot peg is adjustable and can be moved as a child grows. Horses can always be custom ordered with or without special features or additions. That being said, you may have noticed I have recently offered the option of leather tack. The saddles are always permanently attached to the horse for safety. Stirrups are adjustable and usable. Bridles are usually removable and fun for children. But it can also be fun to have a horse without tack, as kids love to create their own bridles and “clothing” for the horses. Let imaginations run free! I use hardwoods local to North Carolina, usually poplar, walnut, oak, cherry and sometimes other types depending on what is available. The wood is all kiln dried to remove insects and reduce the moisture to about 10%. In the past I worked hard to use reclaimed lumber, but now I usually use new lumber from Gennett Lumber. Reclaimed lumber can be difficult to locate and I end up with a lot of waste due to unusable parts of the wood. I wrote a bit more about this decision in a blog post, which you can read here. I love working with reclaimed lumber on more traditional furniture, but for carving, it is not practical. I use milk paint as a finish for horses that need to be painted. This is an all-natural, biodegradable, non toxic paint that is safe for toys. I currently use the product from The Old Fashioned Milk Paint company. It is made with food-grade ingredients and is completely free of lead, VOC’s, and anything else you wouldn’t want on your child’s toys. The colors are deep, smooth and rustic looking. They produce a matte finish that seals wonderfully under the oil top coat. It is a very long lasting paint that should not flake or peel over the years. Many other wood workers use chemical or petroleum based sprays that need to be applied wearing gloves and a respirator in a special sealed and ventilated room. I’m glad I can paint my horses in the living room and blend the colors with my fingers! I have asked the company about milk related allergies, and they do not have any information about allergies. They recommend talking with your allergy professional. I will update this information if I ever hear any feedback about milk allergies and milk paint. I use a natural, non-toxic linseed oil to seal and finish all the horses and toys called Tried and True Danish Oil. This oil is naturally polymerized using heat to help it dry faster and create a durable protective layer. It contains no heavy metals or synthetic materials. It is also food-surface safe and completely safe for toys. I top coat this with an oil and wax finish to improve protection. You can make all kinds of customized additions to your horses. You can choose from yarn or natural horse hair for the manes and tails. Eyes can be hand carved or substituted with glass eyes. The glass eyes are fixed with a synthetic wood epoxy. Leather tack can be a fun addition. Contact me with your thoughts!